When I declared Desigual’s Spring/Summer 2014 runway my favorite show of the season, I suspected I might feel the same if we were lucky enough to have them show again for fall. And, I was right. I stepped into their backstage, and instantly began to smile. The atmosphere was remarkably calm, despite the hordes of foreign and domestic press squeezing themselves into a tiny space (thanks, once again, to the remarkable Deb Hughes and her incredibly organized staff). And then, there are the clothes. I defy anyone to slide into a Desigual dress, shirt, jacket, pair of shoes, whatever, and not feel fun and flirty and just plain happy, all day long. Yes, these clothes make people happy, and that’s by design. But they’re also cute and lovely and easy to wear. And that’s down to a team of designers whose main brief is to make clothes that make men and women happy. Let’s start with their overriding theme: “La Vida es Chula”, or “life is cool”. Take a look at the smiling, posing, joyful models on the runway, and you know, life can be cool. The theme of the show was “Love in the City”, a mod, yet modern look at boys and girls having a ball. Think Twiggy or Jean Shrimpton, skipping through the streets of London, New York or Madrid. No, make that Barcelona, the city that inspired the looks. It’s the attitude you’d want to wear the Barcelona-based design house’s looks. Big, bold patterns and brightly colored prints decorated short, short skirts, shift dresses, shorts and tops. Black and white with bursts of bright red and orange, purple, navy and green. Because it’s fall/winter, there were biggish belted coats, as well as gloves and accessories. 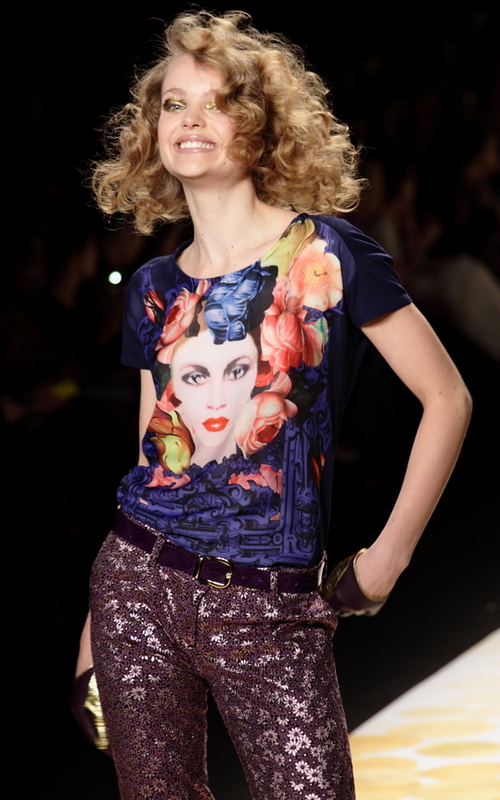 It was about attitude and joy and love, everything Desigual sees in its devoted customers. It’s hard to believe we’ll have to wait six months before we see this collection in Desigual’s shops. But I take comfort in remembering how much I loved their spring collection, and, guess what? That’s in the stores right now! La Vida es Chula. This entry was posted in Fashion and tagged Anton Brookes, Debora Fougere, Desigual, fashion, Lincoln Center, MBFW Fall/Winter 2014, mercedes benz fashion week, New York Fashion, New York Fashion Week, NYC, Red Stiletto Media, runway. Bookmark the permalink.